The city and its urban spaces can be seen as a fragmented whole carrying meanings and traces of culture, use and politics with it. Whereas architects impose new stories and meanings on the urban fabric, the city itself is layered and assembled and bears witness to social flows, routines and everyday spatial arrangements. However, in master planning and urban design, these traces of culture are often neglected. In cities such as Damascus, Rome and Berlin, the traces of history and shifting empires and ideologies are evident. Traces are left in the urban fabric, in architecture and the way urban spaces are shaped. In Damascus, traces from the Roman Empire, Christianity and the Ottoman Empire are materially present in the old city, whereas the French influence and modernist urban planning mark the area around Umayyad Square in the west. Here straight lines, structured through the star formed “étoile” similar to the Parisian Place de l’Étoile, points to a rationalization of urban life contrasting the labyrinthine and layered collage of the old city. Structures such as the Étoile are the ultimate example of representational urbanism in French rationalist planning as carried out by Baron Haussman. Rationalist modernist planning as carried out by Haussman and later Le Corbusier are examples of how modernization and rationalization of the city seek to organize and often control the informal materialization of everyday life in the city. Cultures and religions, through shifting planning rationalities, leave traces in the city. Everyday life and citizens shape urban spaces. They may be ephemeral and temporal, yet they can be the traits giving a neighborhood its unique identity, its atmosphere. Whereas urban monoculture is identified in many western cities today due to global transactions and capitalist consumer culture, immigrants carry other traces of globalization with them. The traces of immigrant culture reassemble urban spaces through heterogeneous signs, habits, symbols, informal economies and commercialization. However, traces of culture, the routines and everyday habits of immigrant culture can emerge both from an informal colonization in everyday life and from intentional design practices. 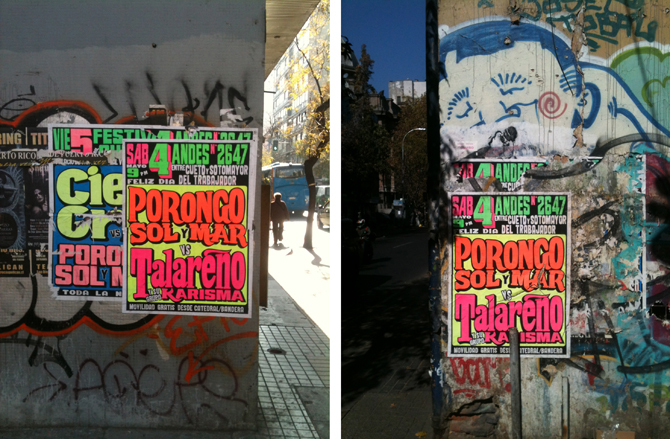 By juxtaposing immigrant spatial traces in Santiago Centro with the intentionally-designed traces of immigrant culture in Superkilen, Nørrebro in Copenhagen, it’s possible to see how cultural traces influence public space, and how various ideologies and politics are interwoven into the urban fabric by means of urban traces. During the transition to democracy after the military dictatorship, the area of the economy remained heavily defined by neoliberal economic policies. Chile, due to the economic openings that resulted in a number of free trade agreements, presented a suitable area for immigrants from neighboring countries in search of new job opportunities. Since the beginning of the 90s, there has been an increase in immigration in Chile. Whereas immigrants initially came from neighboring countries such as Peru, Bolivia and Argentina, the immigration today has broader coordinates: Colombia, The Dominican Republic, Ecuador and Haiti. The intensity by which these Latin American immigrants use the city can be observed in various neighborhoods: Recoleta, Independencia, La Chimba, Barrio Brasil, but most characteristically and with the most intensity in the historical center of Santiago. 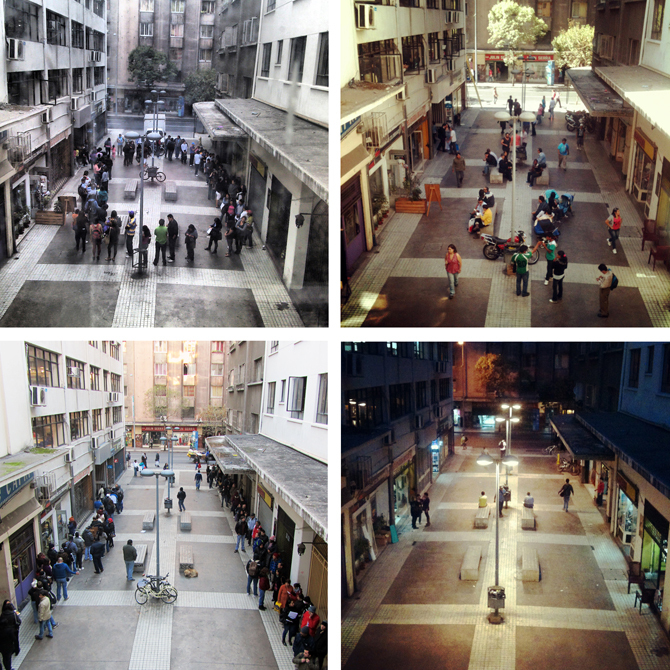 In Santiago Centro new forms of spatial appropriation, occupation and manifestation of public space take place. The city that emerges reveals new organizations, traces and geometries and tracks the interaction of bodies and constant flow of immigrant movement across the city. These immigrant flows redefine the spatial characteristics of Santiago Centro. You can see a series of spatial logics being modified by the new inhabitants. For instance, the walls are no longer borderlines; rather, they transform into central screens where these cultures manifest themselves and where they can express their traditions. The wall acts like mediators for the diverse cultures, a place for cultural encounters where new hybrid urban forms emerge. Rather than separating urban cultures, the walls support the encounters of cultures across borders. Furthermore they are sites where you can find an exemplary use of public space. In that sense, the Latin American immigrants become super users and reshape Santiago Centro as a space for the public, created by the public. 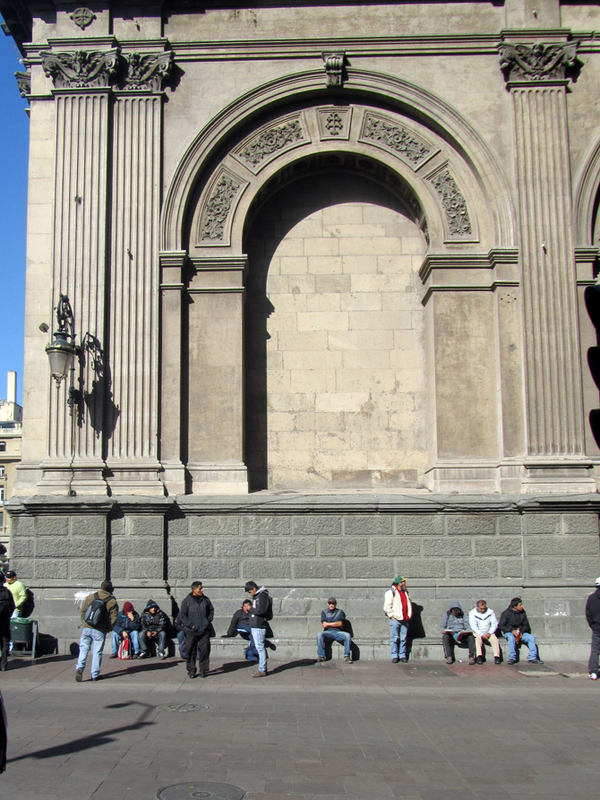 The wall on Santiago Cathedral, with its characteristic stone façade, is a territory conquered by the immigrants, a kind of bastion providing space for daily meetings between different personalities of the Peruvian community. On this everyday venue outside of the sacral church space, construction workers, informal traders and the unemployed mix with women, kids and youth. In this way, the cathedral street, also known as Little Lima, takes on a laid back character as people assemble and meet on the wall, reading newspapers and exchanging local news, information and goods. Whereas the wall is the place for daily encounters, the opposite side of the cathedral street is colonized by different programs and uses that come out of necessity: long distance phone booths, remittances, stores, restaurants, bars, nightclubs and salsa clubs. In this way the wall is the kilometer zero mark of immigration in Santiago, a space that draws lines to other places, to long distance relationships and where the city is reenacted as spaces of longing and belonging. Through a visual intervention, the Peruvian community makes a public invitation to a block party. The public wall is used for private interests, thus transforming public walls in Calle Bandera into a script of vernacular culture. These imported visuals and graphic expressions from Lima are part of what is called “cultural Chicha.” In the graphic elements of colours, food and popular culture are brought together in a hybrid visual language unconcerned about identity, but rather referring to cultural layers and mixed style inherent in Peruvian culture. Thus the informal breaks with all rules, cultural norms and good taste. The prostitutes working in San Antonio Street originate mostly from Colombia and the Dominican Republic. Sometimes they develop certain types of street interventions on the walls or in the display windows. 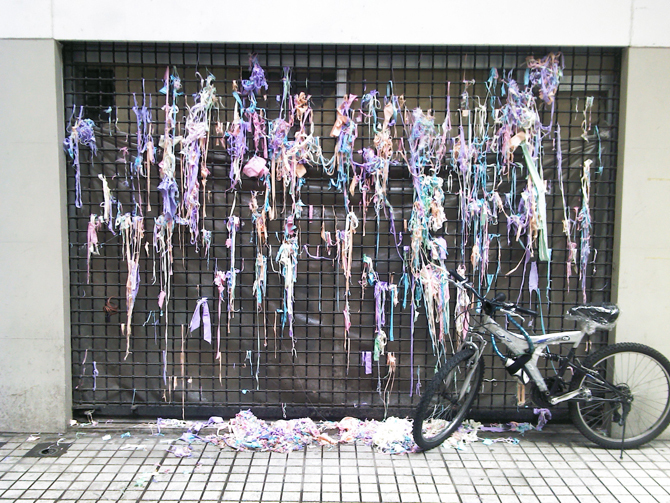 It is an aesthetic way to express feelings or personal conflicts with the street as a venue for everyday conflicts. The neighbors and the passers-by refer to what they see as “macumba” — a word with African roots, which in some parts of Latin America, relate to rites of black magic and witchcraft. The market place in Santiago Centro is called “Trade and Persian Markets,” referring to the traditional typology of the bazaar found in Muslim and Middle Eastern countries. In this particular case, the Persa Santo Domingo Market is very close to the characteristics of the bazaar. A labyrinthine organization, it is a covered space with high density and a constant flow of people buying and selling. Here, immigrants have established their local stores to offer and sell products. Incrementally, the adaptations have occupied the inner space of the market in a vertical manner. 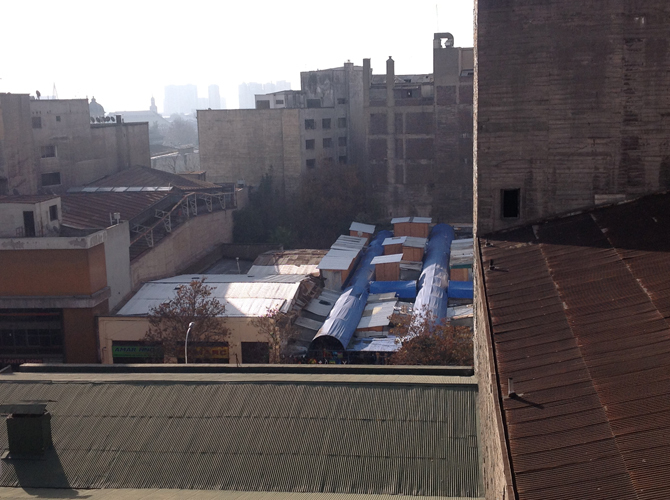 The adaptations and extensions of the local shops have extended into making roofs covering the products. Like a living organism the ground of the market hall has informed a new layer separating the private sphere from the flow of the city; the rooftop structure is basically reserved for dwelling. The process for getting residence and work permit is not fast in any country. Santiago is no exception; in public space, you often see large queues of immigrants waiting from early morning to late evening. In the Passage Irene Ariztía, outside the Department of Migration and Immigration, the same patterns and geometries are reproduced. The patterns repeat themselves and differentiate according to the spontaneous organization of the people. Are these patterns, in fact, informed by the desire and hope for a better and more peaceful life? What dreams lie behind these ephemeral organisations? And will the desired document change the material manifestation of globalisation taking place in Santiago Centro? 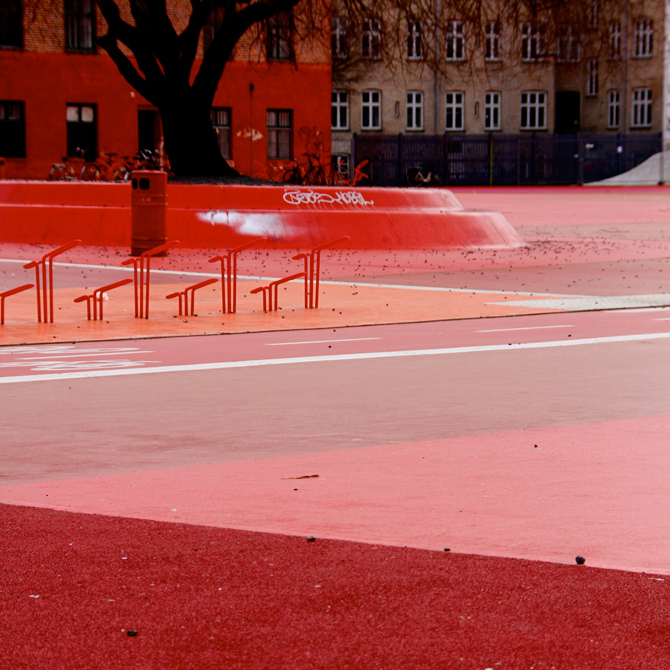 Superkilen is a public park in Copenhagen, Denmark. Situated in the periphery of the multi-ethnic neighborhood Nørrebro, it was designed to give the ethnic communities a public space for recreational use. The Parallel Competition was won by a notable team of architects, designers and artists: Danish architect Bjarke Ingels group, Berlin-based Topotek 1 and the Danish art collective Superflex were chosen due to their innovative concept dealing with issues of user involvement, place branding and visual design tactics. Most interestingly, the art collective Superflex approached the design as a participatory project involving the users and citizens in the neighborhood. 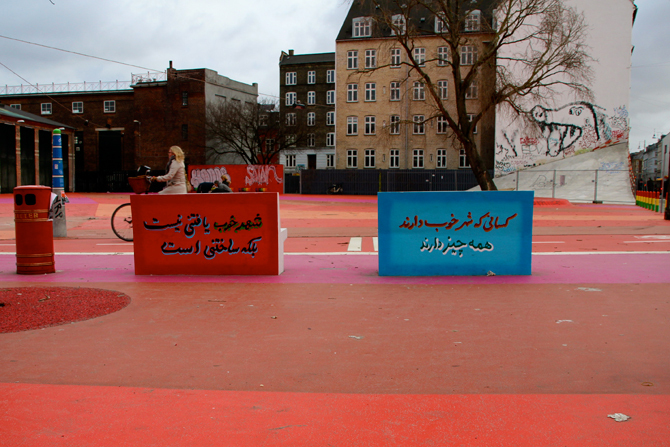 Claiming to conduct “extreme user involvement” in opposition to the conventional public hearings of the municipality, Superflex went out in the Nørrebro neighborhood asking the citizen immigrants what kind of urban furniture they wished were part of the design. 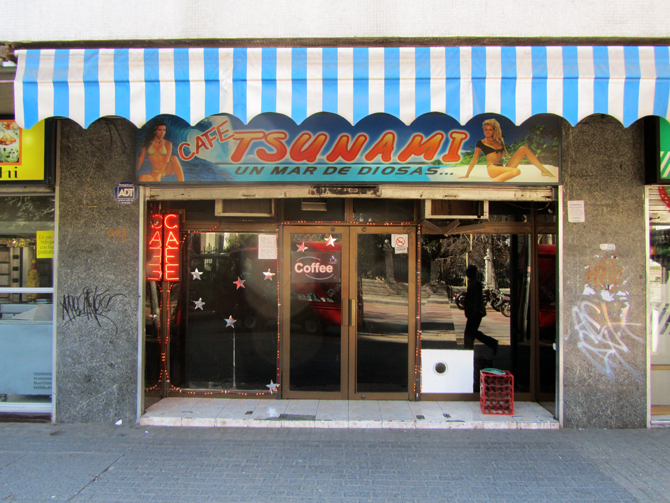 The result is a maximalist and heuristic fusion of taste, signs, and commercial cultures from all over the world. A bus stop from Kazakhstan, benches from Brazil and donut signs from the US are but a few of the visual objects found in the park. Framed by three zones — the Red Square, the Black Market and the Green Park — the urban furniture draws signs and consumer culture together. As a visual and spatial assemblage of the mashed-up aesthetics in a globalized world, the design of Superkilen is an interesting yet troubling interpretation of how cultures leave signs in public space. However, are these objects and components authentic traces of the ethnic communities living in the neighborhood, or is it rather an ingenious and clever spatial branding of the Danish capital? On the surface, the design promises the ideologies of a welcoming; the user involved in a nonhierarchical society. But what meanings do the intentionally designed traces of culture bring with them? How do they portray urban culture in Copenhagen? And does the design correspond with the everyday life and routines of ethic minorities and immigrant cultures in the neighborhood? Before Superkilen, the area was a former railway track cutting through Nørrebro. Despite being a vacant space without any programmed facilities apart from a biking lane and a green landscape, the area was used for picnics by the local Turkish and Middle Eastern communities. Informal economies of various kinds were also said to take place in the forgotten strip of land. Today, the urban design of Superkilen has re-furbished the vacant lot with strong imagery and a colorful representation of the multicultural communities in the neighborhood. Symbols and signs take over where everyday practices formerly took place. Design programming for specific actions lay out forms for social behavior. The black square rhetorically points back to the former informal economies. Today, however, you do not find a black market, but the opportunity to play chess and backgammon. The strict line of chess tables suggests an ordered form of gambling in public where informal bets and negotiations are visually ordered. Despite tracing Middle Eastern culture in the design, the chess tables become a formal, designed colonization of otherwise informal, playful activities. Rooftops – signs of longing or belonging? Mjølnerparken, the residential area next to the green area, is on the Danish “ghetto list”. The ghetto list is developed by the Danish government to trace demographics and neighborhoods with a high degree of ethnicity. 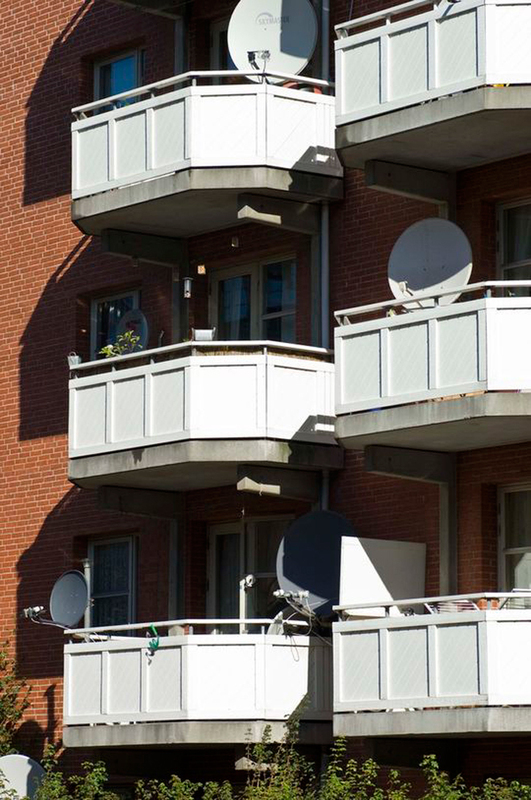 Being a neighborhood on the ghetto list connotes a lack of integration into Danish society – a societal failure in the eyes of many politicians. 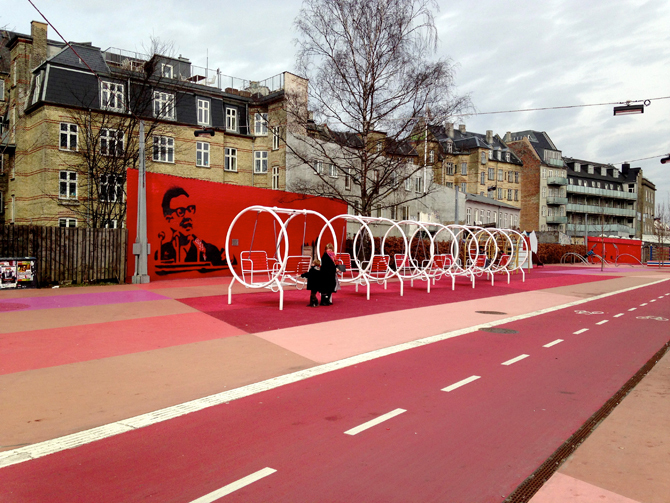 In the efforts to change the negative connotations related to the ghettos, Danish urban design has increasingly become a tool for communicating a more positive image. The parabolic antennas of Mjølnerparken point in one direction. 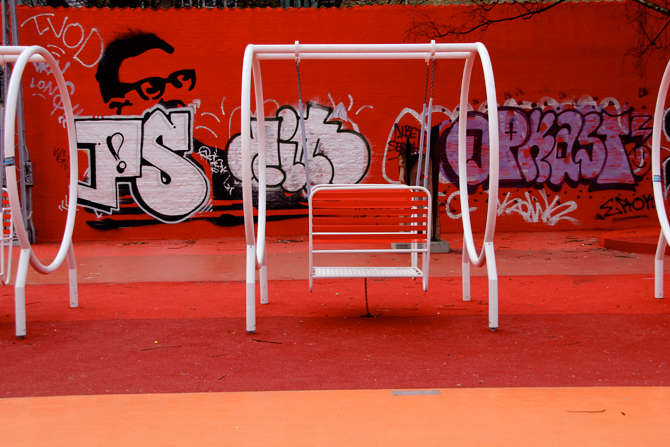 The colorful surfaces and playful signs at the Red Square point in to one another. While the white parabolic antennas on the red brick buildings in Mjølnerparken leave traces of what goes on in the private spaces of the immigrants, the public square outside tells another story. The parabolic antennas on the rooftops point towards a longing for home — a longing for the signals from TV shows and images from the country left behind. The parabolic antennas secretly compete with the empty signifiers on the Red Square — American donut signs juxtaposed with the word Moscow Russian. On the rooftops of Mjølnerparken, longing, and the lack of belonging in Danish society, seem to intertwine. Two walls draw attention in Superkilen: the mural of former Chilean president Allende and the street art collage by American artist Shepard Fairey. Formal street art aesthetics meet informal everyday graffiti. Whereas the latter has been erased and repainted after gradually falling apart, the former is a political gesture signaling red ideology and sympathy for the democratic elected President Allende, who was brutally evicted in the military coup in 1973. The mural is a reproduction of Valparaíso marking the 100-year birthday of Allende in 2008. 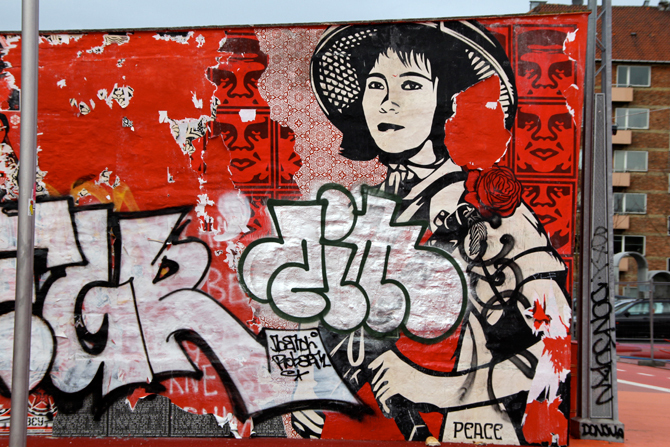 The mural made by Shepard Fairey juxtaposes his own brand, the face from OBEY, with a Korean partisan made in propagandist style. However, local graffiti artists quickly took over the wall, inscribing their own signs and style. The re-appropriation of the wall, from Fairey to unknown everyday street artists in the neighborhood, clearly marks how signs of commodified culture exchange with local sub-cultural inscriptions. Interestingly, the Fairey mural was recently repainted into a homogeneous red surface, whereas the local re-appropriations on the Allende mural have been cleansed leaving the stencil image of Allende free. Thus, it is not only local citizens interfering in the writings on the wall, but it is also local authorities deciding what should remain visible and what should be repainted, breaking with the informal way urban signs emerge and disappear over time. 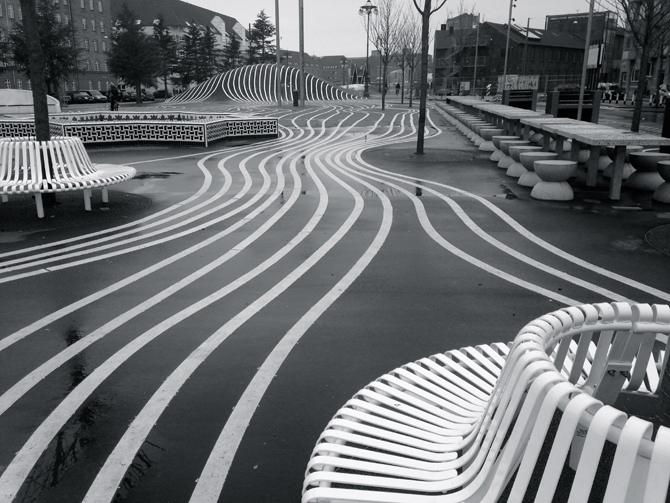 Much of the urban furniture at Superkilen proposes bodily movement and play. It showcases sports facilities from all around the world; thai boxing, for instance, and open air gym equipment create venues for social participation and play. The facilities are popular among the young people and children in the neighborhood. You can swing, play your music on the Jamaican sound system or play chess in the black square. Just the fact that young Palestinian girls, an old Danish couple and a guy from Jamaica went travelling around the world to collect their dream objects for the square witness a playful process for integrating desire and dreams in the urban design. On more levels, the design of Superkilen represents a vision of a society where playfulness and social interaction between the citizens equals a healthy non-hierarchical society. The objects also represent a culture of fitness mania where working with the disciplined body is preferred over playing video games and hanging out in the local mall. Thus the design objects for play are at the same time ideological traces of the health policies in Copenhagen. The welfare state wants the population to be healthy — running tracks, fitness instruments and bicycle lanes are significant design tools in shaping the ideal healthy society. But how does this correspond to the notion of play? As noted by James S. Hans, “It is through play that man adapts to his changing world, that he constantly challenges and changes the rules and structures by which he lives.” But if play is already designed, how can the citizens adapt to the urban environment through their own playful activities? Evidently the former ground in the area is hidden to give space to the programmed areas, the Red Square, the Black Market and the Green Park. The natural ground is replaced by the symbolic representation through design. Whereas informal economies most likely took place in the area of the Black Market, these activities are today only metaphors underlined by the black asphalt and the name: the Black Market. The soil is visible only one place: on top of the hill in the Green Park, where a red-brownish area forms a small path. On the sign you get the story for this remarkable open wound in the otherwise strictly programmed design: The soil origins from Palestine are collected by Hiba and Allaa as a part of Superflex’ participatory art project, along with the two Palestinian girls living in the neighborhood. Thus the act of collecting and transferring Palestinian soil into Danish ground becomes a thought-provoking political gesture supporting Palestinian rights to their land. 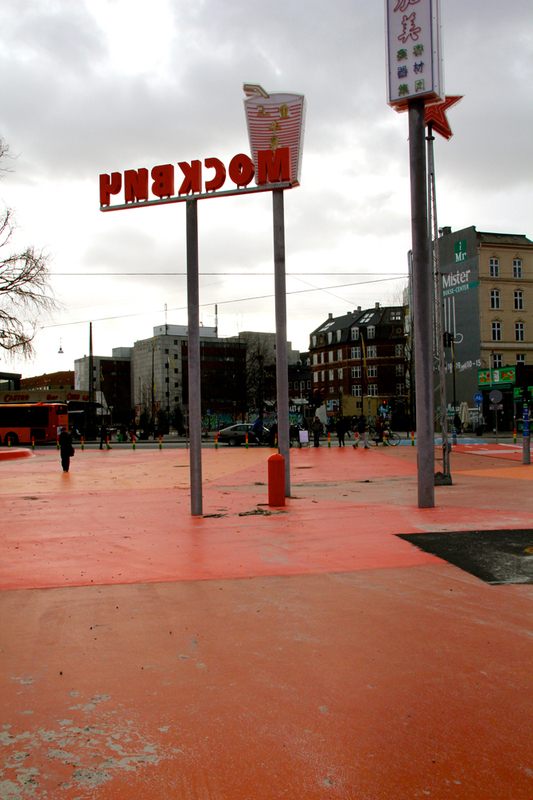 As Jewish symbol or objects are nowhere to be found in Superkilen, it has become a common interpretation that the design of Superkilen has underlying ideologies connecting left wing ideologies and support for minorities to a market based and global society. 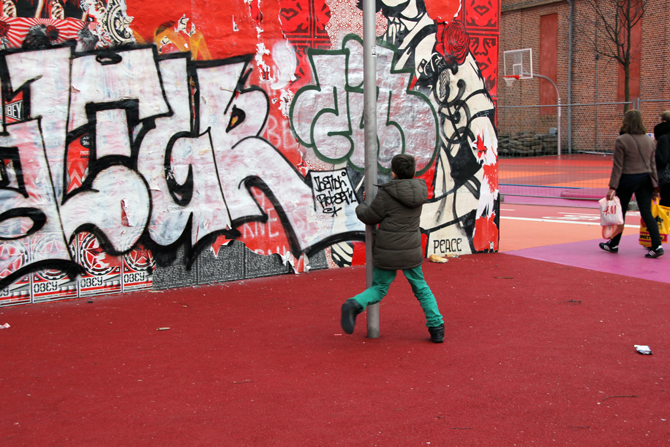 In Superkilen, cultural acts and everyday performances from all around the world are made into design commodities. 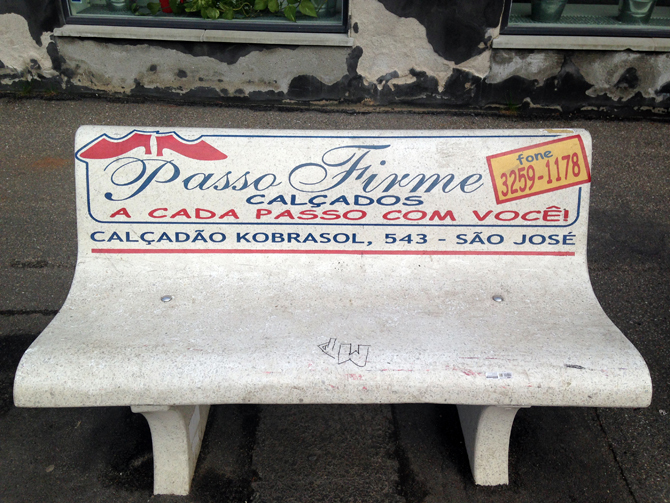 A commercial on a bench for shoes in Sao Jose, Brazil, gains new meaning in Nørrebro, Denmark. The participatory design of Superkilen points to the city as a complex assemblage of global signs, commodities, and ideologies. But the design says little about the people making it. 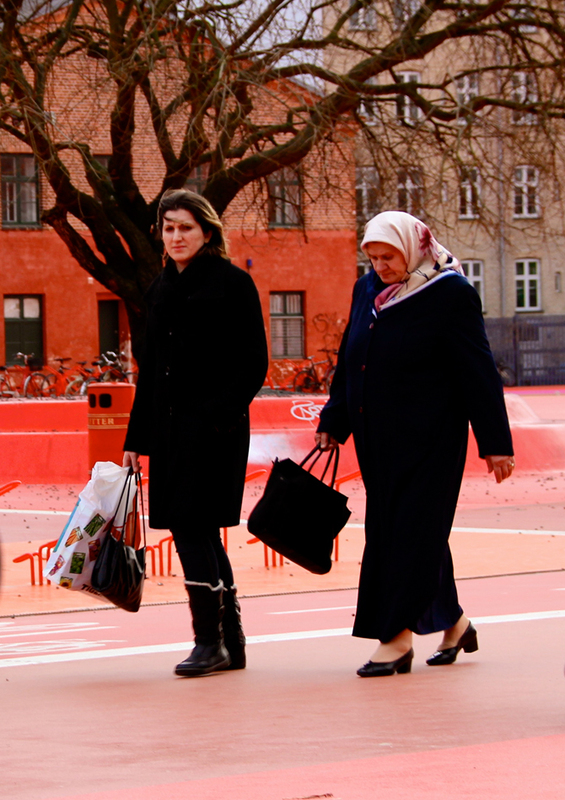 Superkilen is an example of a visual representation of a presumed multicultural diversity. However, it does not imply that the urban space is multicultural. Local citizens are represented as cultures through signs and objects, but do they inscribe their daily habits and culture? What traces of people are left behind? 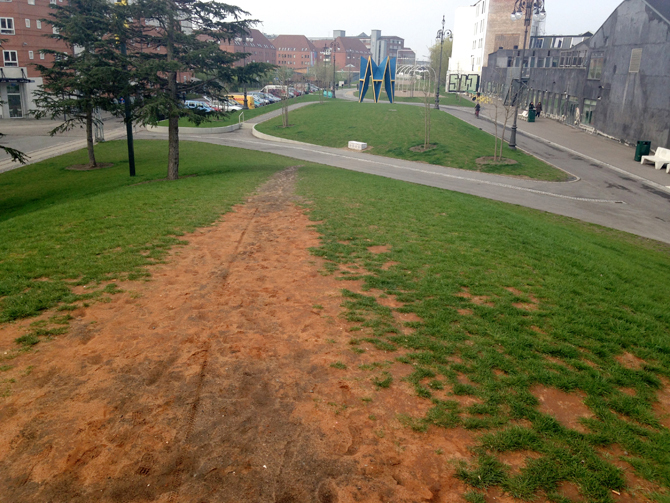 Based on the two urban spaces Santiago Centro and Superkilen, we can identify two forms of traces in the city. The first is socio-cultural inscriptions based on everyday performance, and the second is intentionally designed representations of culture. A comparison of the two ways of leaving traces of culture and use in public spaces thus questions basic assumptions in urban design. How do designer and urban architects design for the users? How can design take existing traces and take them into consideration? Is spatial programming necessary? How can designers profit from the cultural multiplicity and complexity already present in the city? In Santiago Centro, a representational fountain was turned into a pool through the everyday use of the immigrants. The wall of the cathedral was turned into a place for reading the newspaper and discussing politics. Spatial appropriations are significant traces of the everyday city. It may not be visually significant and perhaps it does not qualify as design, however, everyday routines and acts leave significant traces in urban space. Actions and use give form to space. In Superkilen, the designed intentions were to involve the users. 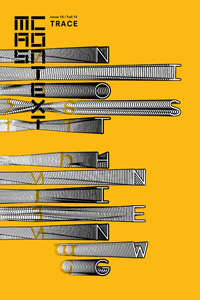 Superflex carried out a process of radical user involvement. However, the end result is more representational than performative because the design does not directly give form to space. It gives form to a highly sophisticated design solution, breaking with the Danish modernist tradition. But compared to the transformations of public spaces in Santiago Centro, the design by Superflex, BIG and TOPOTEK 1 take the shape of an original way of visual representation and even branding of ethnic minorities. Kristine Samson Ph.D. is currently an assistant professor at Performance Design, Roskilde University in Denmark. Her research is on urbanity and performance – for instance how art and design in public spaces engage people and how urban spaces are negotiated and transformed through art, performances and everyday use. She has written several articles on urban design and performance art and is currently co-editing a volume on Situated Design Methods on MIT Press. José Abásolo is an architect with Master studies in etsaB-UPC. He has worked on research projects in Santiago, Spain, Cyprus, Afghanistan, Brazil and India. Since its formation in 2008, Abásolo has been part of the URBZ collective. In parallel with this practice he has developed a career as a professor, where he teaches at the University of Talca and UNIACC in Santiago.